Summary: Things in Delilah Hannaford's life have a tendency to fall apart. She used to be a good student, but she can't seem to keep it together anymore. Her "boyfriend" isn't much of a boyfriend. And her mother refuses to discuss the fight that divided their family eight years ago. Falling apart, it seems, is a Hannaford tradition. Over a summer of new friendships, unexpected romance, and moments that test the complex bonds between mothers and daughters, Delilah must face her family's painful past. Can even her most shattered relationships be pieced together again? Rich with emotion, Sarah Ockler delivers a powerful story of family, love, and self-discovery. My Thoughts: We are introduced to Delilah Hannaford and her small knit of friends/family including her work-a-holic mom, her dad whose been dead all her life, her sassy aunt, her non boyfriend Finn, etc. Delilah has been getting into a little bit of trouble and than her grandmother up and dies. Delilah hasn't talked to her grandmother in 8 years. She knows there is a bit of family history/fighting there but she has no clue why. So they pack up and go spend the summer in grandma's house trying to get things in order to sell the house. Delilah gets down there and she runs right into Patrick aka Ricky. She hasn't seen him since they were kids and she really did miss him! He's changed a bit. The boy is hot, he can sing, he even is still smitten with Delilah. Delilah grows closer to him and also meets a new friend named Emily. Delilah finds her dead aunts old diary and starts to read it and uncover some of the family's secrets. I really enjoyed this one, I didn't like it quite as much as Twenty Boy Summer. It was still a good book but focused more on family than romance (even though Patrick was a nice touch). I also saw the ending coming for a while. I just had a feeling that that was the reason they left all those years ago, and the past just got buried. 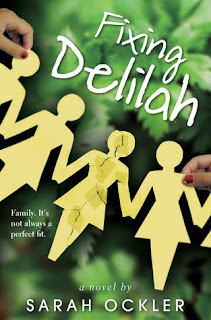 Fixing Delilah was full of secrets, love, and family. Overall: Fixing Delilah was such a thrill to read! If your a fan of Sarah's, pick this one up soon! Cover: Saw a few different covers of this one and I have to say this is my favorite. I do believe its the final cover. It's much more interesting than the others!